1. Why is Vitali concerned about Barilla’s approach to order fulfillment? There are several concerns with the order fulfillment at Barilla. Both the manufacturers and the retailers are suffering from thinning margins and are in need of a system to reduce costs. The current system leaves Barilla with impossible means of anticipating demand swings as well as massive amounts of inventory being “held” at the retailer. Stock-outs are an additional concern in the order fulfillment process. In order to reduce cost and improve service levels, supply chain strategies must take into account the interactions at various levels. 2. What is the approach Vitali suggests for overcoming distribution inefficiencies? Vitali’s suggestion is to collect data from each distributor daily and use the data collected to make replenishment decisions based on forecasts. In order to do so, improvements should be made to Barilla’a forecasting systems in addition to developing a set of decision rules for making decisions based on the forecasting system. 3. Describe the JITD approach. 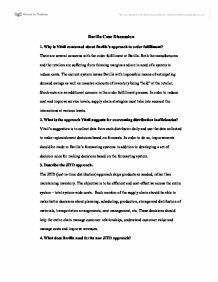 The JITD (just-in-time distribution) approach ships products as needed, rather than maintaining inventory. The objective is to be efficient and cost-effective across the entire system – total system-wide costs.Each member of the supply chain should be able to make better decisions about planning, scheduling, production, storage and distribution of materials, transportation arrangements, cost management, etc. These decisions should help the entire chain manage customer relationships, understand customer value and manage costs and improve revenues. 4. What does Barilla need for its new JITD approach? 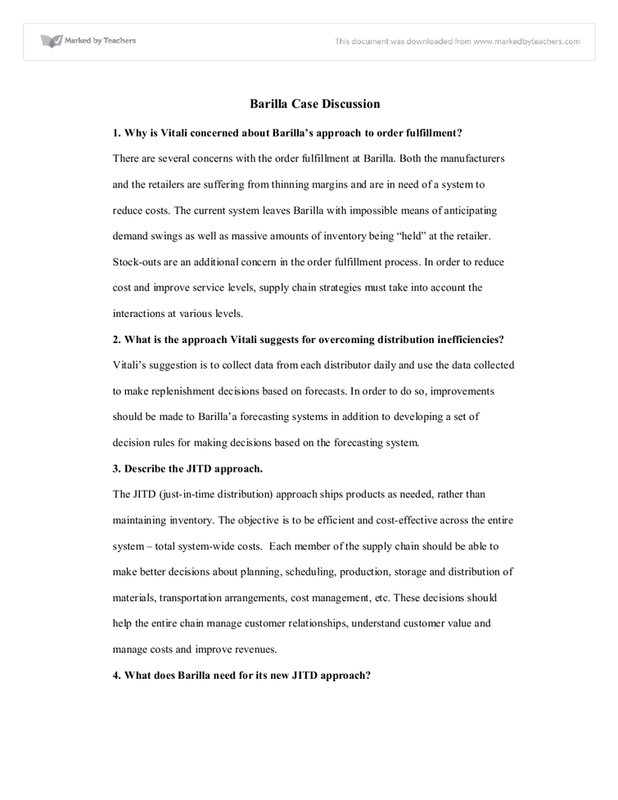 Barilla needs several items in order to successfully implement its new JITD approach. To start, they will need data provided daily from the distributors. Thus, Barilla will need a strong, clear line of communication with the distributors and the distributors must willingly provide the necessary information. Once distributor cooperation is achieved, improvements to the forecasting system of Barilla should be made as well as the development of a set of decision rules to help determine what to send after each forecast. What are the concerns about the new system raised by Barilla’s marketing and sales people and its distributors? Barilla’s sales people are concerned with disruptions in sales levels and increased risk of creating more shelf space for competitors. Marketing people at Barilla have concerns with not being sufficient, risks related to stock-outs, and a lack of trade promotions. Distributors are concerned with efficiency in comparison to the current distributor inventory system. 5. How should Maggiali solve the implementation problems? Supply chain management should take into consideration every facility that has an impact on cost and plays a role in making the product conform to customer requirements. In order to solve the implementation problem, Maggiali must develop a strong line of communication with the distributors and retailers. Barilla may achieve this objective if it can successfully convince the distributors of the benefits of implementing the approach. The objective is to be efficient and cost-effective across the entire system – total system-wide costs and thus, provide benefit to the entire. Barilla should concentrate on the benefits all parties can achieve. Cost analyses should be ran to provide an idea of the benefits involved. In addition to the concerns of the distributors, Maggiali should analyze the cost savings and cost reductions of implementing the approach in order to ease internal concerns. The program should be well-developed and efficient before implementation in order to avoid error and disruptions in distributor operations. Introduction to e-commerce. Benefits, risks and legislation. will furthermore be conveyed out. The CATWOE investigation mentions to considering about the diverse places that stakeholders take up as to the exact scheme recounted in the origin definition. In a phrase, the "root definitions" is the origin from which the form in stage 4 increased (Patching 1990). before the event takes place. It is important before staring the project that we have an efficient and competent project team in place. The project team would include the sponsor, which is Best Shows client, the team member which will be led by me, the Project manager. Do you consider the price of the product when purchasing it? A Lot of people consider the price of the product when purchasing it this means that price should be considered and should be what the customers want. 7. Most DO?s are doing simple periodic-review inventory systems, and ordering each week. There is no sophisticated method of tracking or forecasting ordering quantities. The end result is that demand variability from DO?s to Barilla puts a severe strain on Barilla?s manufacturing and logistics flow lines. This improved technology will not only make it easier for individuals and companies in different countries to conduct business with one another, but will also further decrease the cost of communications. These improvements will undoubtedly hasten the already rapid pace of globalization. - Printers: Printers allow users to print images they like from the internet. It is also used to provide receipt for customers after transaction. - Ipads: Ipads has all the facilities that the users need. Such as, they can shop online from ipads too as it has internet browser in it. Functional Structure A functional Structure is characterised by a system where people who owns the same skills are grouped together forming a department or division. Each departments are featured with clear lines of command, precise objectives and responsibilities. Advantages ? departments are focussed in operations on specific tasks.